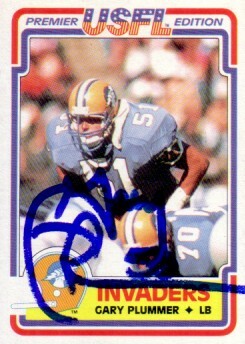 1984 Topps USFL Rookie Card autographed in blue marker by former Chargers and 49ers star linebacker Gary Plummer. Obtained in person. With certificate of authenticity from AutographsForSale.com. ONLY ONE AVAILABLE FOR SALE.